Grace and peace to you from San Salvador, El Salvador! Nearly all of the members of our February 2014 Thrivent Builds/Habitat for Humanity El Salvador Mission Team have arrived in San Salvador. There are a few who are still in route, but they should be here soon. They may have to write a blog post at some point this week with the highlights travel adventure to El Salvador this year! This is my third or fourth trip to El Salvador, I’m not sure. I’ve passed by the monument in this picture each time I’ve been here, but never took time to notice it before. 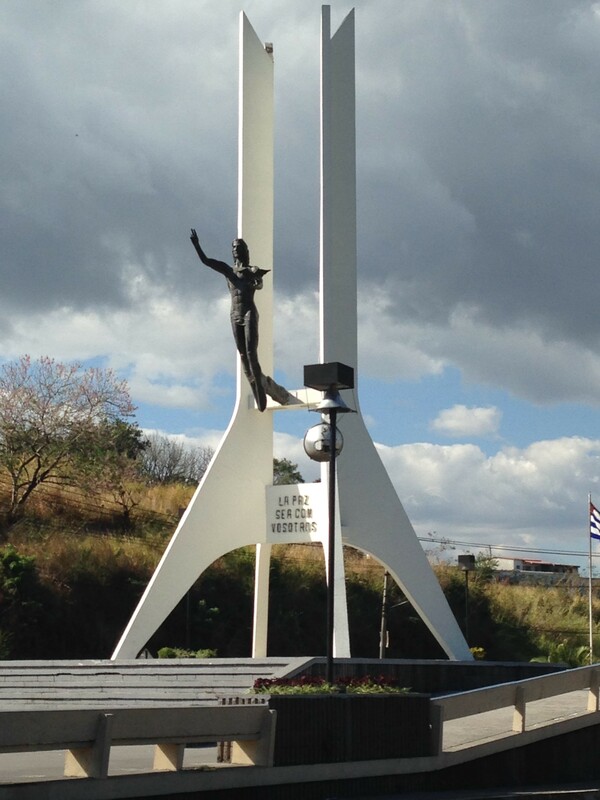 This monument greets you as you leave the San Salvador airport property and make your way into the city of San Salvador – El Salvador’s largest. There are presidential elections taking place in El Salvador tomorrow – Sunday, February 2, 2014. It’s quite interesting to be here during this time. Needless to say, the focus in this part of the world is in fact NOT on the Superbowl tomorrow. May our brothers and sisters in Christ in El Salvador continue to seek peace as they celebrate election process tomorrow. May this week’s Mission Team arriving from a land very different than this find peace in their work and relationships with the Salvadoran people. And may they discover that same kind of peace in their work and relationships when they return home. This entry was posted on Sunday, February 2nd, 2014 at 12:27 am	and posted in The Church in The World. You can follow any responses to this entry through the RSS 2.0 feed.